If you want a quick change for your fireplace brick, a coat of oil based paint is a cost effective way to get a brand new look. Painting over a drab outdated brick fireplace gives an instant facelift with dramatic results. And the best part it that there’s no experience necessary for this simple project. If you have a few hours and a few tools to get started, you’re ready to tackle the job. The first order of business is to choose a color. Bold colors like dark gray or black give a dramatic look while a light shade of white, tan or pale gray give a fresh neutral look. Think about what mood you’re trying to create in your room and take into consideration your furnishings, natural lighting and flooring when making your decision. A few tools and some paint and you’re ready to get started! Clean the surface of the bricks. Wear your safety goggles and gloves and use a wire brush or sponge to clean the bricks with TSP or another cleaning solution. Let the bricks dry. Cover your floor with the drop cloth and apply painter’s tape around the edges of your brick near your walls. Apply the primer using a brush following the manufacturer’s instructions. After the primer dries, use a roller or brush to apply the latex paint over all the brick. A small brush can be used to get into the crevices and hard to reach mortar areas. You can apply up to three coats, depending on the look you want, allowing time for each coat to dry before applying the next one. 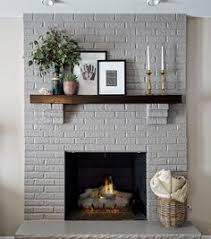 Please note that the latex paint can be used on the outer brick of the fireplace. A special high temperature paint must be used inside the firebox where the fire burns. Whether you choose a darker color, a pale shade, or pure white, your fireplace will stand out in your room and be the beautiful focal point it was meant to be. Consider your mantel color when choosing a paint color. Is it dark wood or a shade of white or cream that matches your molding? Think about the accessories you’ll display on your mantel. For example, if you have a colorful painting, a plain understated background may be a perfect backdrop to make the colors pop. You wall color is also a factor to consider. You’ll want the shade you paint the fireplace to complement, not compete with, the color of the walls. Take a look at these three photos to get some inspiration. Each paint color gives off a different vibe. Which one is your fav? Are you looking to achieve a more authentic, “real brick” look? View our Brick-Anew Fireplace Painting post to find out how you can achieve a more natural brick look.